Vyavastha Darpan has taken due care and caution in compilation of its content & other features. The views and comments expressed by individual subscribers on Vyavastha Darpan are their own, and not that of Vyavastha Darpan or its management. The contents of the portal are for information purposes only and should not be taken seriously to constitute any advice or critical decisions. Vyavastha Darpan strongly advises users to check with concerned experts before taking any decision based on information displayed on Vyavastha Darpan. However, Vyavastha Darpan does not guarantee correctness, accuracy, adequacy or completeness or up to date of any information and is not responsible whatsoever for any errors or omissions or for the results obtained from the use of such information including (but not limited) to any comments, feedback and advertisements contained within Vyavastha Darpan. Vyavastha Darpan especially states that it has no financial liability whatsoever to any user on account of the use of information provided on its Web Sites ( vyavasthadarpan.com) or its affiliates/groups web sites. Also neither the Company, its affiliates nor any of their respective employees, agents, third party content providers or licensors warrant that Vyavastha Darpan Site will be uninterrupted or error free; nor do they make any warranty as to the results that may be obtained from use of Vyavastha Darpan Site, or as to the accuracy, reliability or content of any information, service, or merchandise provided through Vyavastha Darpan. Vyavastha Darpan is not responsible for any errors, omissions or representations on any of our web pages or on any links on any of our web pages. Vyavastha Darpan does not endorse in anyway any advertisers on our web pages. All Users of Vyavastha Darpan agree to verify the authenticity of all information on their own before undertaking any alliance with our or any affiliate group websites. Vyavastha Darpan also contains material in the form of inputs/feedbacks submitted by users and Legend News accepts no responsibility for the content or accuracy of such content nor does it make any representations by virtue of the contents of Vyavastha Darpan in respect of the existence or availability of any goods and services advertised in the contributory sections. Vyavastha Darpan makes no warranty that the site contents are Virus -free or anything else, which has destructive properties and shall have no liability in respect thereof. Part of Vyavastha Darpan contains advertising and other material submitted to us by third parties. Kindly note that those advertisers are responsible for ensuring that material submitted for inclusion on Vyavastha Darpan complies with all legal requirements. We do not accept liability in respect of any advertisements. At times, Vyavastha Darpan will also contain articles contributed by several individuals. The views are exclusively their own and do not necessarily represent the views of the Vyavastha Darpan or its management. The linked sites are not under Vyavastha Darpan control and thus we are not responsible for the contents of any linked site or any link contained in a linked site, or any changes or updates to such sites. These links are being provided to you only as a convenience, and the inclusion of any link does not imply endorsement by us of the web site. 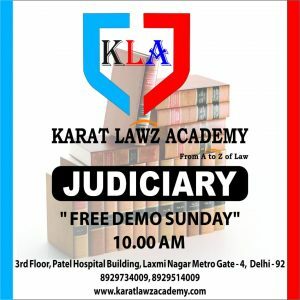 All legal proceedings shall be subject to the jurisdiction of the courts in Aligarh, Uttarpradesh (irrespective of whether Courts/Tribunals in other areas have concurrent or similar jurisdiction. ), and shall be governed by and construed by the laws of India.